I Love Purple More Than You: Should I Let Them In? Should I Let Them In? Say hello to our new security camera. Mounted just outside our front door. It provides a live feed directly to my computer. That way whenever someone comes to the door and my big, protective husband is not home... I can just mosey on over to my computer and see if I want to open the door or not. Ok, if I’m being completely honest, it’s likely there will not be a “mosey”, since I’m always at the computer. Most likely, all I will have to do is just look up to the left top corner of my 24” monitor. That way I can see if I need to exert all the energy it takes to stand up and walk over to the door or whether I can ignore the person at the door and hope they go away. Quickly. No I’m not really as lazy as I made it sound. Well maybe a little. Actually, the security camera was Marshall’s idea after we had three different, obnoxious men approach my door in a span of a week. Each time, the men had read my note to solicitors, and each time they decided they still needed to do their sales pitch or whatever their business was. Each time, after standing on my tippy toes and looking at them through the window in the door, I made the decision not to open the door. 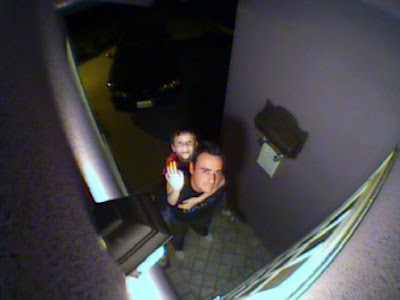 But now that I have this nifty security camera, I can spy on whoever is at my door without them knowing it. They don’t have to know that I know that they know that I know they’re there. Got it? So if you find yourself outside my front door, reading my sign... don’t forget to look up at the nice camera and wave. Because you know that I know you’re there.